We often get all kinds of calls asking for technical advice, from both owner-operators trying to troubleshoot a problem with their truck to repair shop mechanics who are looking for a second opinion. With all these calls, we notice when multiple questions pop up, meaning it must be a pretty common question. One of these questions that we’ve gotten a few times is “What is injection timing, and how do I adjust it?” If you’ve found yourself asking that same question, this article has the basics that should hopefully give you the information you’re looking for. Injection timing is the timing of when fuel is injected into the cylinder, which alters when the combustion takes place. The time of when fuel is injected can be altered to be injected at different points in time. The manufacturer of an engine does recommend certain timing, which is the timing they set it at when the engine is first made. This timing is usually balanced to get as much power as possible, while still remaining in legal limits for emissions. Adjusting injection timing is also often referred to as spill timing. Usually, injection timing is adjusted to create more power in the engine. Timing can be advanced to create more power. Sometimes timing is adjusted in the opposite direction to fix a smoking or a lag problem. Can Injection Timing be Adjusted on All Diesel Engines? Young or old, timing can be adjusted on any engine. The only difference is how the timing will be adjusted, which is covered later on in this article. Advancing the timing of an engine means that you are moving the combustion up in time. In other words, you are adjusting the timing so that ignition happens earlier than when the manufacturer originally set it to occur. When talking about timing of any kind, but especially advancing, you’ll often hear or see the term BTDC, or Before Top Dead Center. Top Dead Center, or TDC, for a particular piston is when that piston is at the very top of the cylinder, or furthest from the crankshaft. 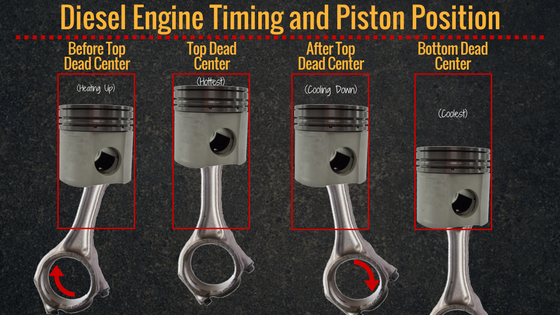 The opposite, Bottom Dead Center, or BDC, is when the piston is at its lowest point in the cylinder, closest to the crankshaft. So, BTDC would be the point before the piston is at its uppermost point in the engine. 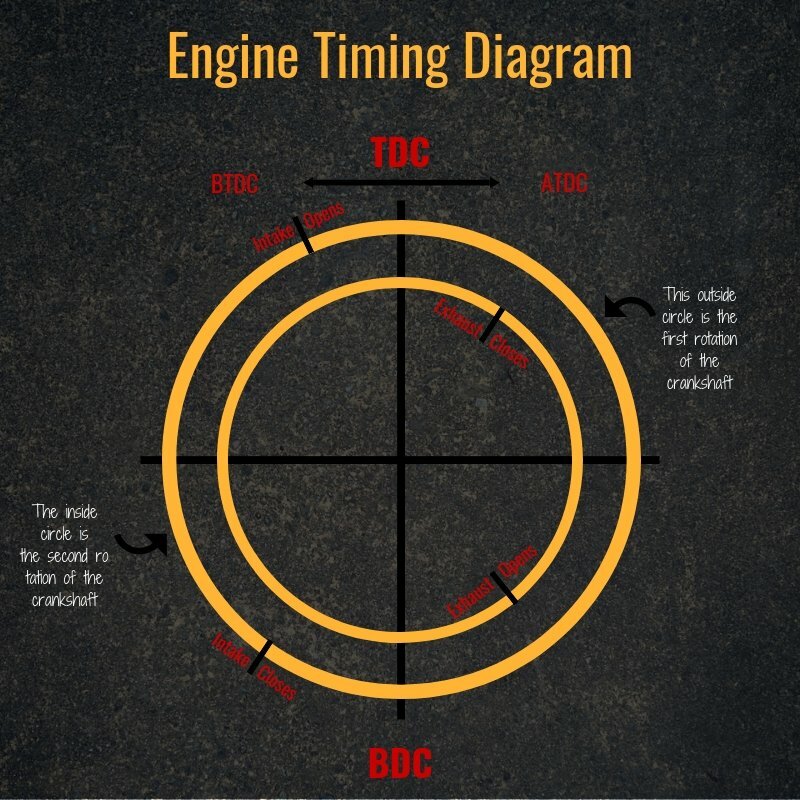 A timing advance is the number of degrees BTDC that ignition occurs. Usually the location is measured in degrees. For example, 10 degrees BTDC is when the crankshaft is 10 degrees before the piston is at its highest point in the cycle. In case you can’t figure out degrees just by looking at the crankshaft, here is a handy calculator. Retarding the timing of an engine is essentially the opposite of advancing. It is when you adjust timing so that ignition occurs after the manufacturer’s original specified time. People will retard the ignition timing of their engines for various reasons, although it is less common. Some of these reasons are fuel economy and performance. The rest of this article will focus on advancing the timing of an engine, as that is the most common timing adjustment. There are several ways you can adjust injection timing, depending on the type of engine you have and how old it is. The most common ways to adjust injection timing are programming the ECM, adjusting the fuel injection pump, replacing the camshaft, and replacing the cam followers or gaskets. For newer engines with advanced engine computer systems, adjusting ignition timing is as simple as programming the ECM. And by “simple,” I mean simple for the people that know how to program them. No mechanical work needs to be done, except for getting to the ECM. From there, a mechanic can plug in a Flash tool to reprogram the computer. Need a new ECM? Check out some of the ECM’s that Highway and Heavy Parts offers here. For older, mechanical engines, there are still several parts that you can manipulate in some way to change the timing. One of the easier ways to mechanically adjust engine timing is to adjust the fuel injection pump. This is as simple as rotating the pump in the engine. Rotating the pump requires just a screwdriver and a socket wrench, which most people have in their toolboxes at home. However, to accurately measure the timing, you will need a special probe or timing meter. It’s important to remember that a small movement of the pump will result in a large timing change, so do not make any drastic adjustments. For a tutorial on how to do this yourself, DoItYourself.com has pretty good step-by-step instructions that go through the fundamentals. Another way to adjust timing is to replace the camshaft. By replacing your camshaft with one that has differently shaped and sized lobes, you can adjust when the valves and injectors are triggered. To do this, you’ll probably need to work with a camshaft guru who can do all of the mathematics to get you the cam that will do what you want. Cams are most often replaced for timing reasons when being used in performance vehicles. A cheaper option for changing when the valves and injectors are triggered is replacing the camshaft followers or gaskets. These can do the same, or very similar, things that replacing the camshaft would do. For example, switching out the cam follower gaskets for thicker or thinner ones would affect when the followers and the cam lobes come into contact, and thus when the rest of the valve train is activated. People advance timing, so there have to be good reasons for messing with it, right? Yes. Advancing the timing will usually increase the amount of power your engine produces. It will also usually increase fuel efficiency. The original engine manufacturers set the timing to balance power and emissions, so that the engines they produce get as much power as possible while staying within legal emissions regulations. This means that they aren’t originally set to produce the most power that the engine is capable of. And if your engine is older or it’s had some work done, it may just not be performing like it used to. Any little thing could affect your timing, so it may just need a bit of a advance to up the power. However, just because you can up the power doesn’t mean that you want to or that you should. This is often a hard lesson for some, but more power isn’t always the goal. Advancing the timing can lead to more smoke. It can cause a lot more vibration in the engine, making it noisier. It will also increase NOx emissions, which is the reason manufacturers usually retard the engines slightly in the first place. And if you don’t care about any of those things, it will actually affect the performance of the engine in other ways; advancing the timing will often decrease and delay boost. A big part of adjusting the timing is doing what’s right for your engine, and if you do it, doing it right. If you’re considering adjusting the timing, take the time to figure out what your engine needs. Maybe you can up your power by replacing injectors, and that would be a better option for your engine. Maybe you should adjust timing. If you do, make sure you know what you’re doing or you hire a mechanic that does. Highway and Heavy Parts staff have the technical knowledge and experience to help you with your internal engine needs. If you have any outstanding questions about fuel pump timing, or diesel engines in general, please give us a call at 844-215-3406 or contact us here.